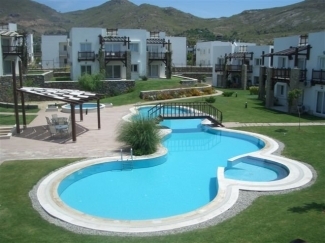 THe PROPERTY IS IN GUMUSLUK NEAR BODRUM ON THE AEGEAN PENINSULA. GUMUSLUK IS FAMOUS FOR ITS WONDERFUL FISH RESTAURANTS WHERE YOU CAN EAT AND WATCH THE SUN GO DOWN OVER THE SEA. PLANES FLY FROM MOST UK AIRPORTS TO BODRUM. A TAXI CAN BE ARRANGED BY ME FOR PICK UP FROM THE AIRPORT. THE RIDE TAKES ABOUT 45 MINUTES. BASIC SUPPLIES CAN BE ORDERED IN ADVANCE SUCH AS BREAD, MILK, EGGS ETC. 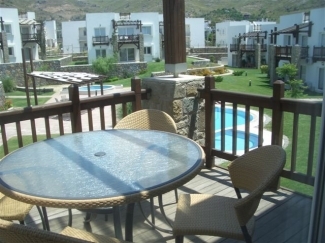 THE APARTMENT IS AIR CONDITIONED AND SLEEPS 4 TO 6 PEOPLE. 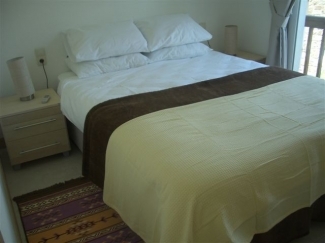 THERE ARE 2 BEDROOMS, ONE WITH DOUBLE BED AND THE OTHER WITH 2 TWIN BEDS. 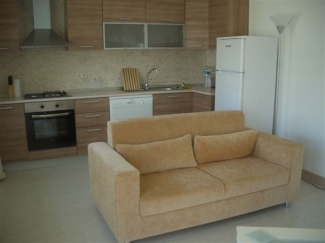 THERE IS A WELL EQUIPPED KITCHEN WITH COOKER, DISHWASHER, FRIDGE/FREEZER AND WASHING MACHINE. THE SITTING ROOM ADJOINS THE KITCHEN AND THERE IS A LARGE BALCONY WITH TABLE AND CHAIRS. THERE IS ALSO A ROOF TERRACE. THE GROUNDS ARE LANDSCAPED AND HAVE A SWIMMING POOL WITH SHADED AREA AND A HOT TUB. THERE ARE PARKING FACILITIES. LOCAL SHOPS ARE SITUATED NEARBY FOR ESSENTIAL ITEMS AND LARGER SUPERMARKETS SLIGHTLY FURTHER AWAY. THE LOCAL BUS TO BODRUM WHICH CAN BE PICKED UP OUTSIDE THE COMPLEX STOPS NEAR A LARGE SUPERMARKET. GUMUSLUK IS A PROTECTED AREA, BEING BUILT ON THE ANCIENT CITY OF MINDOS WHOSE RUINS ARE VISIBLE AT THE BEACH WHERE YOU CAN WALK ACROSS TO RABBIT ISLAND. THE COMPLEX IS SURROUNDED BY BEAUTIFUL, TRANQUIL COUNTRYSIDE. BED LINEN AND TOWELS ARE SUPPLIED, BUT NOT BEACH TOWELS. Prices are negotiable for longer rental periods.